So this is the email i decided to accidentally delete and then try to restore. As you can see this is a really important email i got from John Lennon, so i don’t want to delete it. If i accidentally deleted it, and it was not in my Deleted Items, what can i do? I can use Recover Deleted Items, which we can access through OWA. Right Click Deleted Items, and notice the bottom option is to Recover Deleted Items.. This will open up a new window where you can browse the contents of your Dumpster and recover anything you didn’t mean to delete. 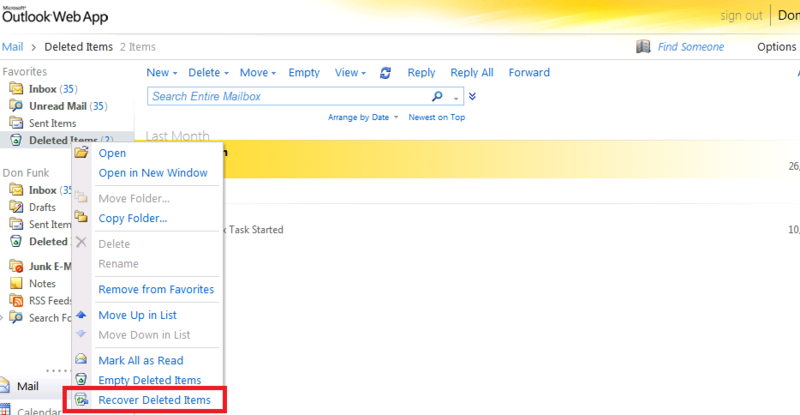 Make sure to select the email you want to recover, then hit the email icon with the blue arrow. 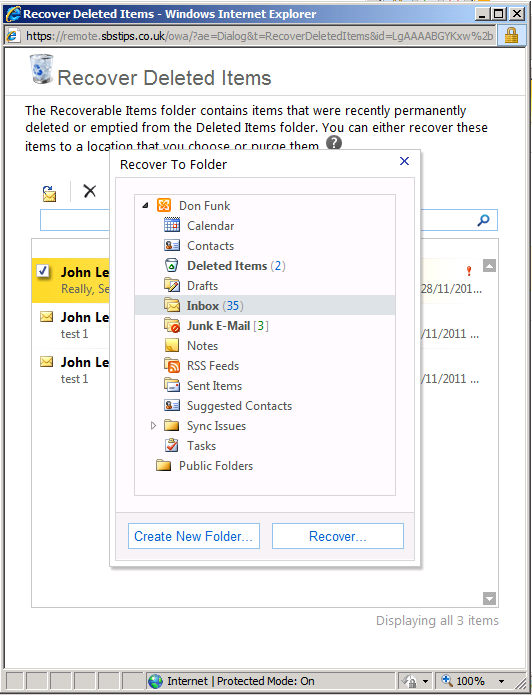 You can then choose which folder to recover the email into, and click the Recover button at the bottom. You may find that the required email is not available in ‘Recover Deleted Items’ this can occur after the deleted items retention period has expired, or if someone accidentally clicks the delete button, not the recover button as described above. 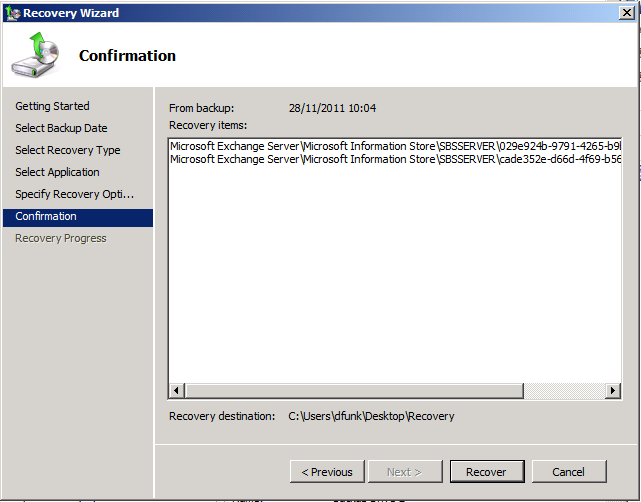 This is the scenario in which you would want to restore your Exchange from backup. First of all we need to restore our Exchange database, of course that requires that we actually have a backup. 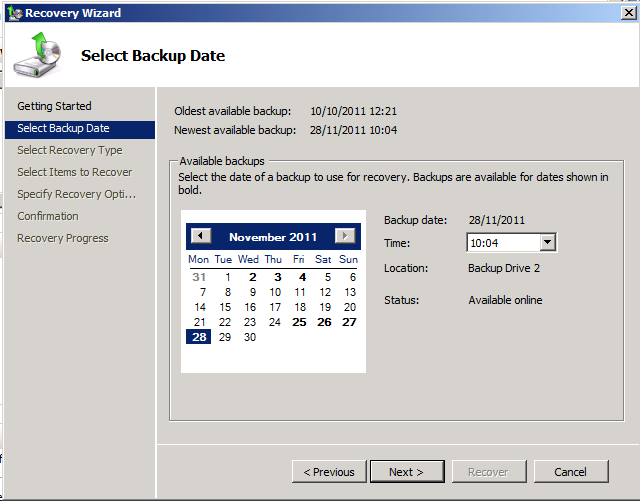 Next choose the date that you want to restore from, and click next. Because SBS 2011 backup links into Exchanges’ VSS Writers, we can chose to restore Exchange as Application, rather than restoring the data files individually. Select Application and click next. 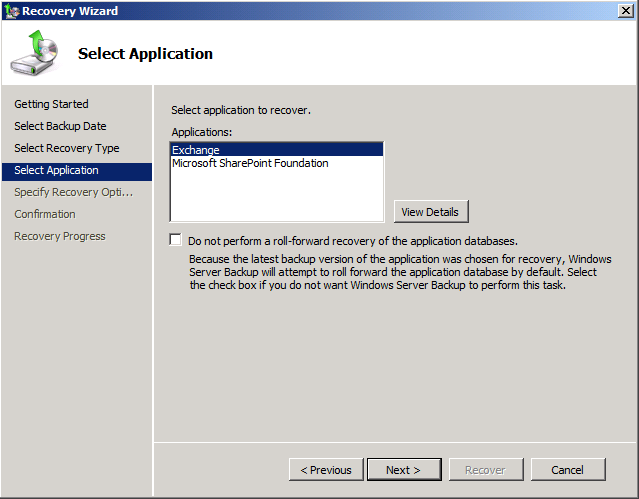 You then have the choice of whether to restore Exchange or SharePoint. Seeing as this a post about Exchange, it is safe to assume you want to select Exchange. 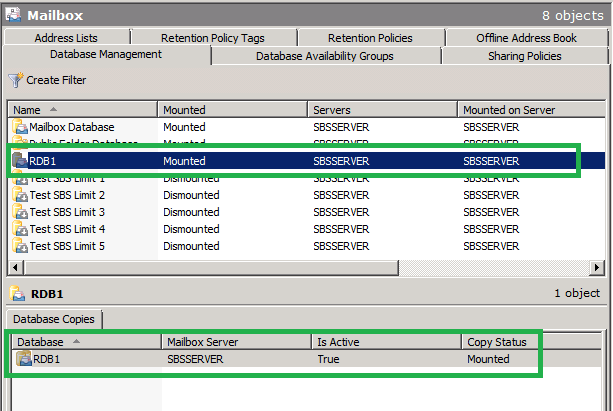 As we are restoring along side the production database and not doing a full BMR (Bare Metal Restore) of the entire Exchange server, tick the box to prevent the roll forward, and click next. The next step is quite important, well i say quite important, i mean Exceptionally Important. Please choose to ‘recover to an another location’ then click Browse, to find a folder on the Server to restore the Exchange to. 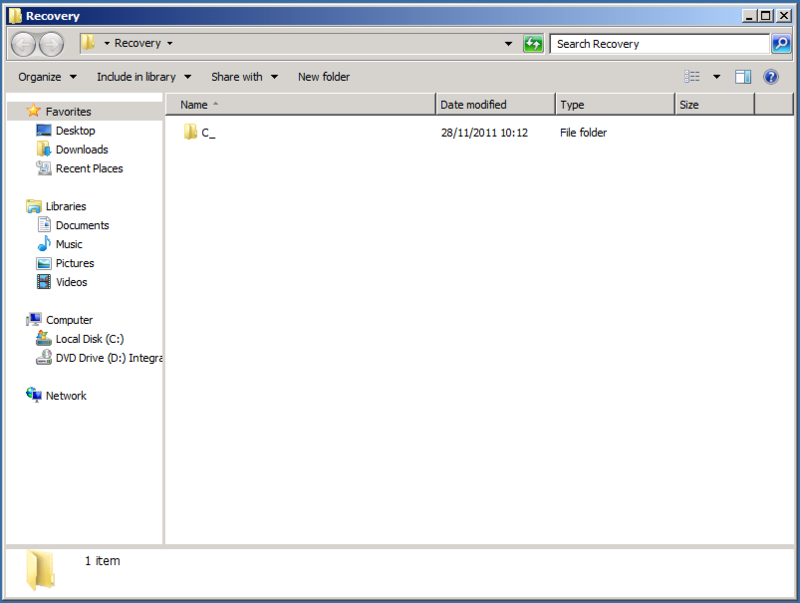 I have put a ‘Recovery’ Folder on my desktop to make it easy to find the recovered folders. Clicking Next will show you a summary page showing which Information Store items will be restored, and to which location. 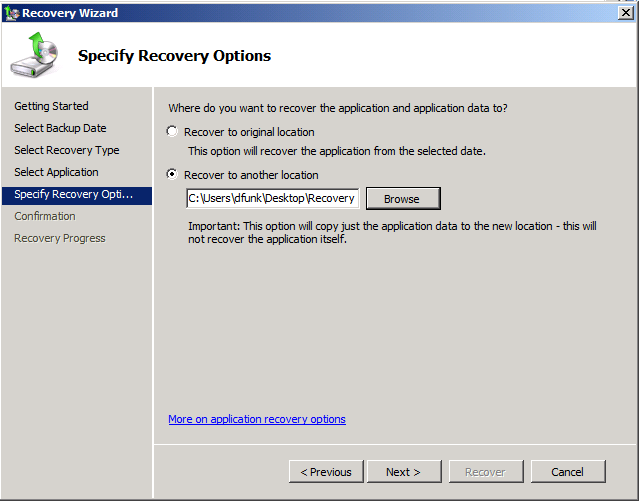 Clicking Recover, starts the recovery process. Remember at this point we are recovering the Entire Exchange Database so make sure you have adequate disk space. Depending on the size of your Database the restore may take quite some time to complete. 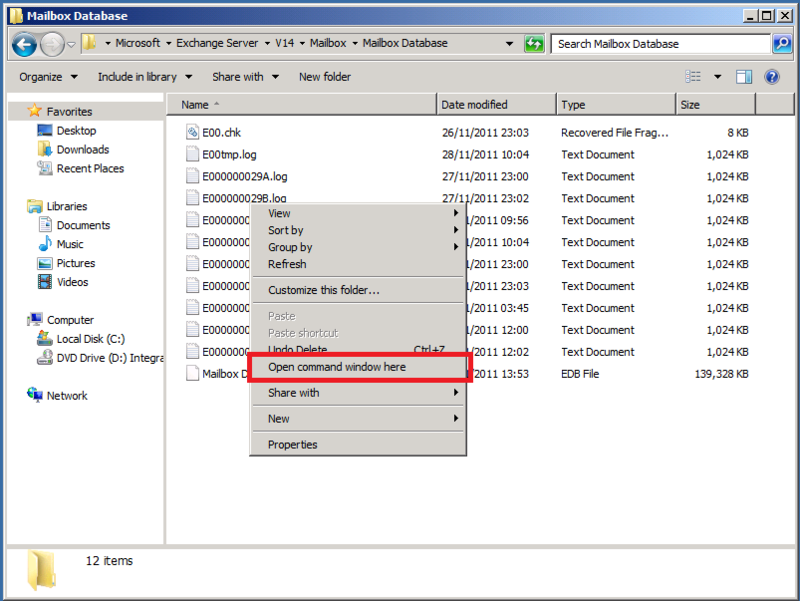 Once it has completed, browse to the folder that contains your restored Database EDB file. 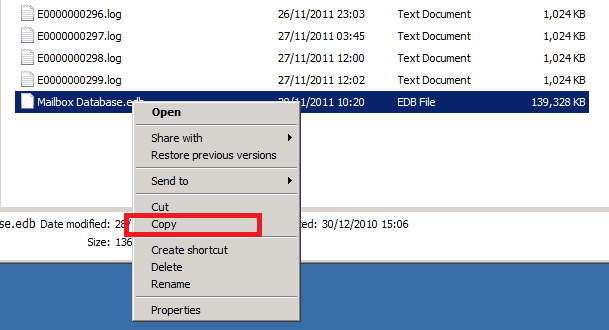 You will notice that the restore procedure has restored into an identical folder tree structure. Hold Down Shift, and Right click some free space, and choose Open Command Window Here. We are going to use Eseutil to check the shutdown state of the database. It is likely the database is in a dirty shutdown state and that we will need to run recovery to bring it to a clean shutdown state. Enter the following command in the command prompt. In the resulting readout, scroll up to see the Database Shutdown State line. If the state shows as Dirty Shutdown we will need to run a recovery command, if it shows as Clean Shutdown you can skip this step. We can also check the status of the Transaction Logs using another switch to the Eseutil command. 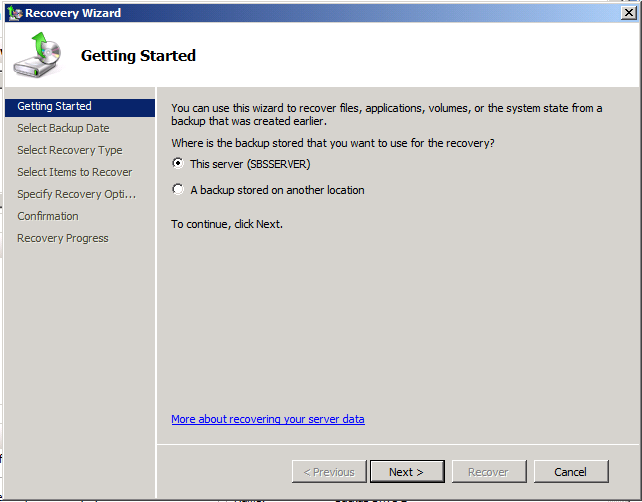 To run recovery we need to run the following command. Your database should be recovered to a clean shutdown state, and you can run the previous Eseutil command (/MH) to check for the state. 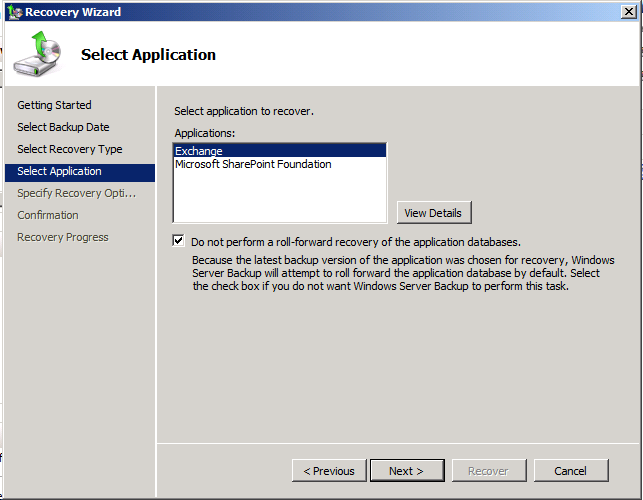 Once you have the database in a clean shutdown state, we need to create a Recovery Database (RDB). 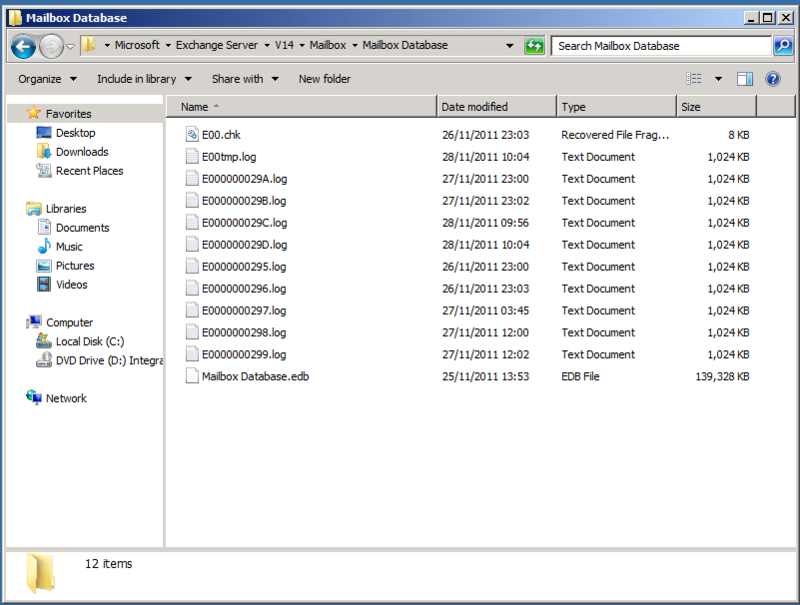 In Exchange 2003/7 we would create a Recovery Storage Group which we could do through the Exchange Management Console. 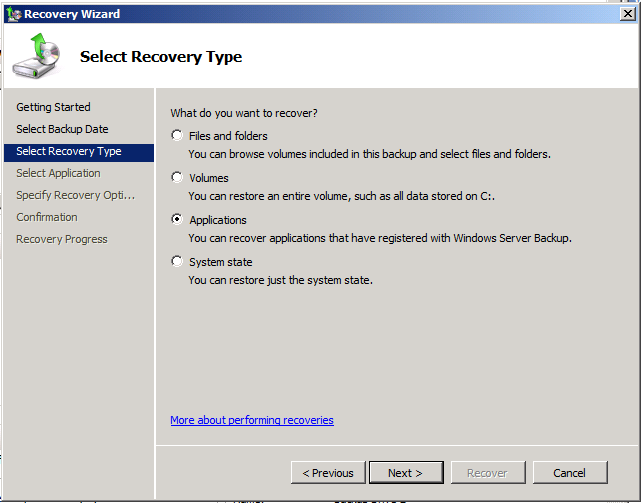 In Exchange 2010 we must use the Exchange Shell to create a Recovery Database. Load up the Exchange Shell and enter the following command. Once the database has been created we need to set the allow file restores flag to true. 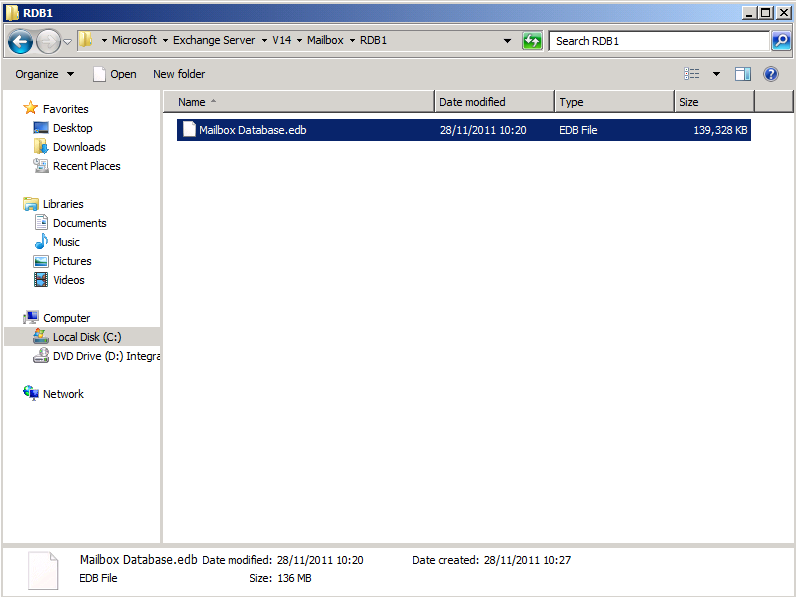 Now we need to move our restored database to the folder our RDB database is looking at and rename the database file “Mailbox Database.edb” to “RDB1.edb”. To check the database has been mounted successfully (assuming you didn’t get an error in the Shell) you can Load the EMC and navigate to Organization Configuration, Mailbox, you should see in the mounted column if the database is mounted or not. We can then run this command to read the database and tell us which mailboxes are present, you probably wouldn’t need to do this in most cases, as you will only have one database but in environments with multiple databases it might be useful to verify you have actually got the right database mounted. Finally we can actually recover some email. 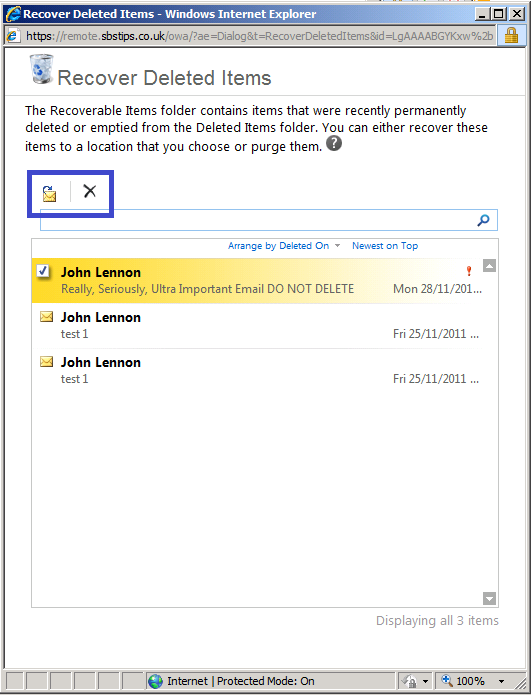 In my Example i have deleted an email from a user called John Lennon which i would like to recover. As i showed at the start of the post, it was a really important email. It also contained the word ‘important’, so i can use the ‘AllContentKeywords’ switch to help find it. Restore-Mailbox -Identity dfunk –RecoveryDatabase rdb1 –allcontentkeywords "important"
Restore-Mailbox is the CMDLET to use, Identity selects which mailbox to recover, RecoveryDatabase selects which database to recover from, and AllContentKeyWords allows me to select a keyword that was present in either the subject or the body. The read out from the Exchange Shell should show you if this was a success or not, but as you can see from OWA, the message is restored almost instantly for me. Specifying a target folder, tells the restore process to put the restored items into a folder you name. This allows us to account for a potential large number of email being restored without causing too much further disruption to the user. Restore-Mailbox -Identity dfunk –RecoveryDatabase rdb1 –TargetFolder “inbox\_recovery” –senderkeywords "John Lennon"
Switching back to OWA we can now see our Target Folder command has built a folder sub tree, and in two folders we have unread items, which are our restored emails. There are a lot of variables in situations where you will want to restore email, variables in the information you have to work with, and also on how specific you want to be when issuing your recovery commands. The links below show how you can use dates to target the restore as well as using the keywords i have shown in my examples. You can refer to the links below for more detailed syntax for the Restore-Mailbox command and for more info on the restore process. Great step by step guide – I will be bookmarking and stalking you on Twitter ! Kidding on the last part. I’ve managed 2003 servers for now over 7 years and installed Home Server and SBS 2011 Std for a friend. 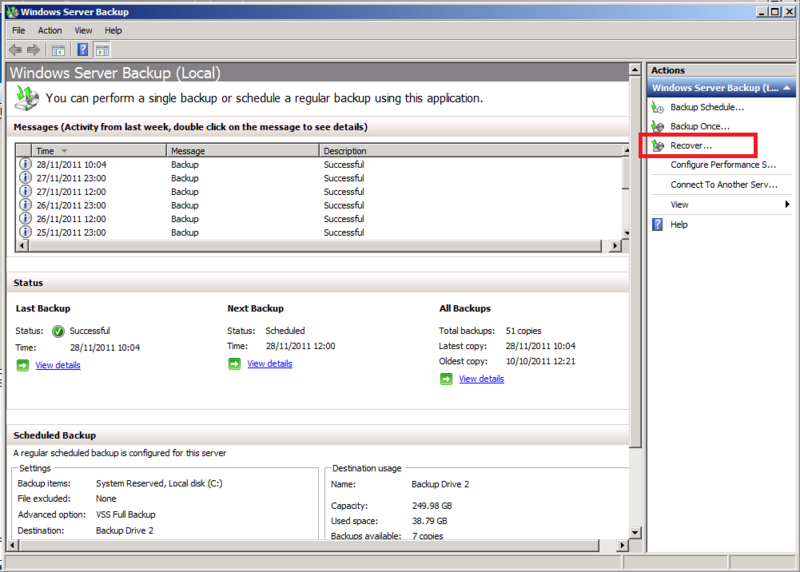 I’ve noticed one striking thing with the SBS 2011 backups you describe here, which related to Dell servers. If you ever wanted to do a Bare Metal Restore using the Dell OEM DVD disc 1 sbs 2011 Setup Disk, you will not see the option on the Install Now screen (after selecting languages) the Repair this computer option. I’ve since rebuilt it and taken an image with a 3rd party package running under a different OS. Excellent article! One of those posts you want to tuck in your back pocket and save. Well done sir, your post will be bookmarked by every tech in our company. I’ve been having problems with our paid-for backup solution and have been considering using the built-in as a fallback, but was unsure on the procedure. You have saved me much research. A good explanation of what the Exchange group has made into quite a silly process, which seems to become worse with each release. It certainly does provide a lot of business for third parties however. I presume that one still cannot recover from databases created on other servers, but it would be good to know for sure. Another reason I just use OnTrack’s stuff, even with its problems. I’m not sure about restoring DBs from another server, but I would assume that, that behaviour has not been changed. Thank you for your excellent article. 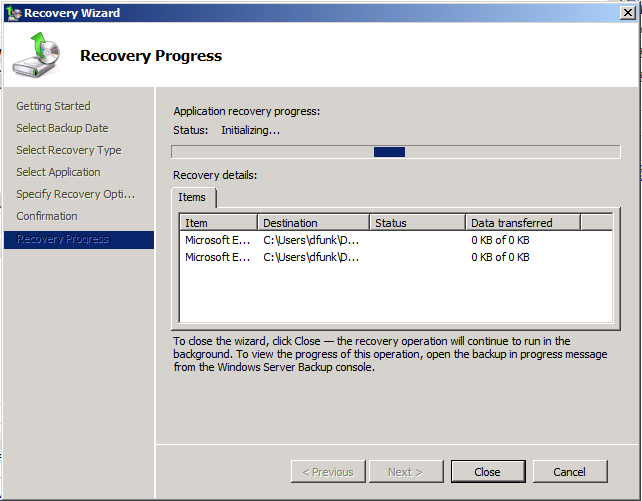 I do have one question – it seems that the restore procedure automatically restores the specified data from the recovery database to the production database – is this correct? If i understand your question correctly, yes. There may be other methods available, but in this instance i wanted to just restore that message into the production database. You can choose to restore data from the RSG to an alternate mailbox if you prefer. When we restore an entire mailbox, do we get to restore the hidden folder which contains all recoverable deleted items as well? Yes I believe the dumpster is restored to the same point in time, with a full restore of a mail box. Warning: The command has completed successfully but no settings for ‘RDB1’ has been modified. Robert I managed to mount RDB1 and all my users are showing I am assuming I will need to do a full mail box restore to get back my calendars. Restore-Mailbox -Identity “SBS USER” It’s the remaining syntax I am unsure of. Thanks for your great post this blog is well worth subscribing to. If you are unsure, I would do a full restore into a test mailbox. https://technet.microsoft.com/en-us/library/bb125218(v=exchg.141).aspx (New-MailboxRestoreRequest) Then you can go into outlook and export the calendar to a PST. It is more long winded, but may be a more comfortable route. 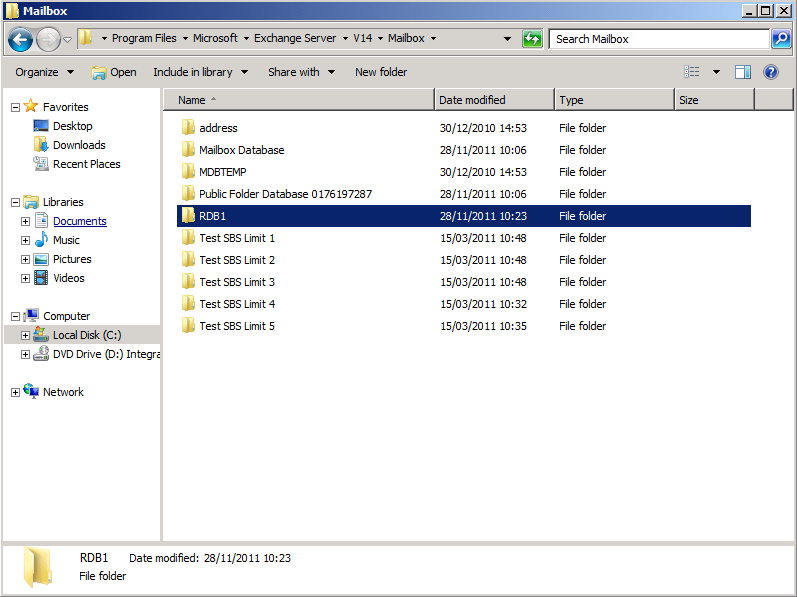 A lot of powershell will not return success – so I would load up Outlook with that mailbox and see if it is recovered. My issue was the display name shown get-mailbox statistics differed to the mailbox name so the PS command worked perfectly when correctly entered.